Distressing footage has emerged appearing to show a schoolboy refugee being grabbed by the throat and shoved to the ground before being 'waterboarded'. Police are investigating an allegation of racist bullying at a school after the harrowing mobile phone clip was widely shared on social media. 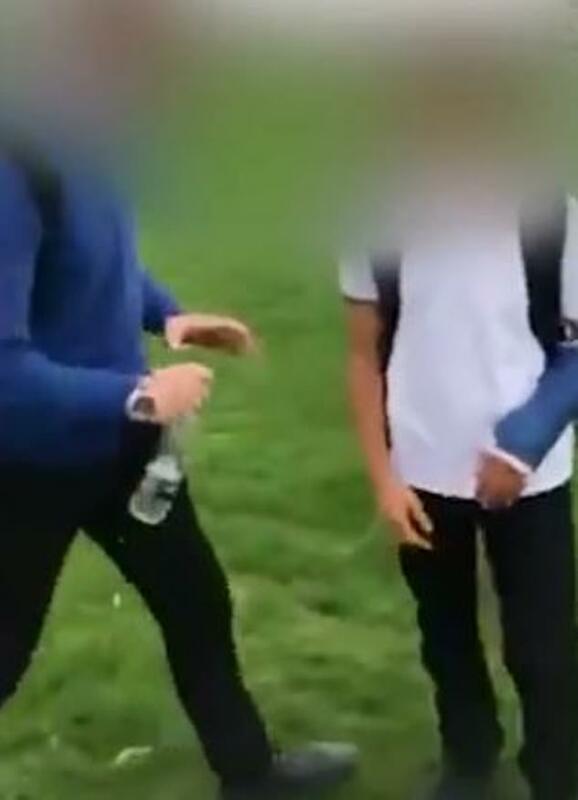 The video seems to show a schoolboy in a blue jumper using racial slurs as he holds his victim - whose arm was already in a plastercast- down by the neck and pours water over his face. An investigation was launched following a huge backlash to the footage. Police confirmed a 16-year-old boy has been questioned. The alleged bully is seen approaching another schoolboy, said to be a 15-year-old named Jamal, who was walking across a playing field at a school in Huddersfield, the Huddersfield Examiner reports. The boy in blue says to the youngster, who is believed to be a Syrian refugee: "What are you doing now then?" He then grabs the victim around the throat and headbutts him before he falls to the ground. The aggressor then tells the boy: "I'll drown you." As the boy is held by the throat, water is poured in his face. The footage was shared on Twitter by Mohammed Khan, who wrote: "I am absolutely disgusted and mortified by the level of hate and ignorance shown by the cowards in this video. "It is of a Syrian refugee who has been bullied constantly in Almondbury High School where apparently...this hasn't been taken seriously." It has been shared nearly 10,000 times. Kirklees Council wrote on Twitter: "A police investigation is underway into the video from a local school. "Neither us nor the school condone violence in any form and behaviour like this will not be tolerated." And in a statement West Yorkshire Police confirmed a teenager had been questioned. Superintendent Steve Dodds, of West Yorkshire Police Kirklees District, said: “We are investigating a report of a racially-aggravated assault of a 15-year-old boy which occurred on playing fields at Almondbury Community School at about 1pm on October 25. Within hours of the footage being shared, a fundraising page raised more than £31,000 to support the victim's family. The page said: "Jamal's family are refugees in the UK and they struggle to meet the basic necessities of life. "We want to raise money for the family to ease their situation and hopefully they can use the funds to help improve their quality of life and to put a smile on their faces. "Having left a war torn country, the least they deserve is to live in peace without being harassed. "Please donate generously and let’s change this horrible situation into a blessing in disguise for them." Almondbury High School head teacher Trevor Bowen said: "The safety and welfare of students is of paramount importance to us and this was a very serious incident. "We are not able to comment further as we are supporting the police with their investigation but I want to be clear that we do not tolerate unacceptable behaviour of any sort in our school." Waterboarding is a form of torture where water is poured over the face of the victim and their breathing passages causing the sensation of drowning.